The Ammonite shell ring is inspired by natural forms and the beauty of the seashore, creating this sweet solid Sterling Silver fossilised swirl shaped shell design by Julian Stephens. Julian Stephens has created this unique and dainty design which is a homage to the most common fossil to be found in the UK, the Ammonite. 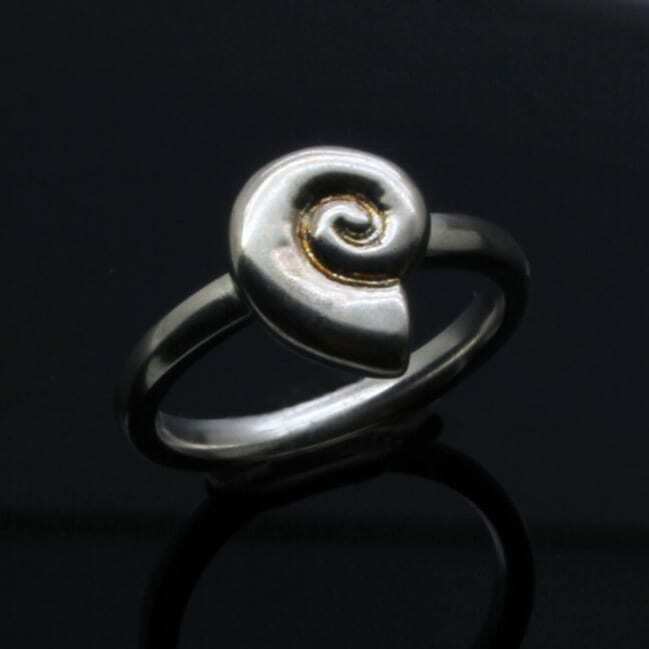 Using the distinctive swirling spiral motif and gentle curves to create this lovely silver shell charm, hand carved in wax and then cast to create this lovely, original design. This silver shell charm is hand finished with a high shine polish and expertly mounted onto a solid Sterling Silver rounded ring shank to complete the design. This lovely hand-crafted ring can also be purchased as part of a set with matching stud earrings also available to buy online through our website. Every ring we make is hand-crafted just for you; please add a ring size or measurement to your checkout information , alternatively you can contact us directly for details on ring sizing options.